Indian head jewellery (commonly known as ‘tikka’) can create a very elegant finish to your attire when dressing for a wedding. This howto is a perfect way to use your old jewellery; perhaps you’ve lost one of your earrings or even broken a necklace. 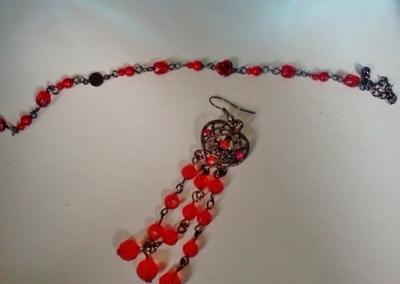 If you need something to match your outfit you can even buy new jewellery specifically for this task. Have a look on Google images for different designs. This will help you plan your final product. Identify which part of the jewellery you want to use. You’ll need a chain and pendant like centre piece. The stones in the main part of this necklace fell out, so I decided to remove the chains and use them. The chain needs to be roughly the same length as your parting. 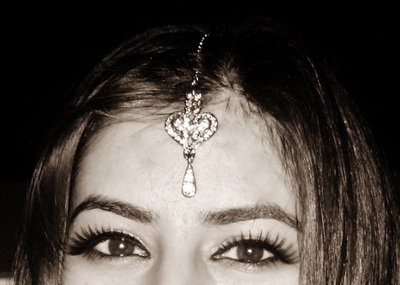 Sometimes the tikka is worn with a side parting and the chain is hidden. The clamp can be inserted inside the link to carefully open it. Try not to open the link too much as the metal may weaken and snap.The chain can then be removed. Hold on to the link as you will need it. The chosen pendent can then be attached to the chain using the same link. Use the clamp to gently close the link. You may find that you need to mix and match different jewellery items. For example this earring by coincidence matched this bracelet, so I rearranged some of the beads for the final product. Traditionally the tikka has a small hook which is used to attach it to the hair. However, a hairgrip is equally effective and can be used to fix it in place. Here are some I made earlier. This will give you a good idea of how long the chain should be. You can always hang on to extra links and beads, they might come in handy next time.